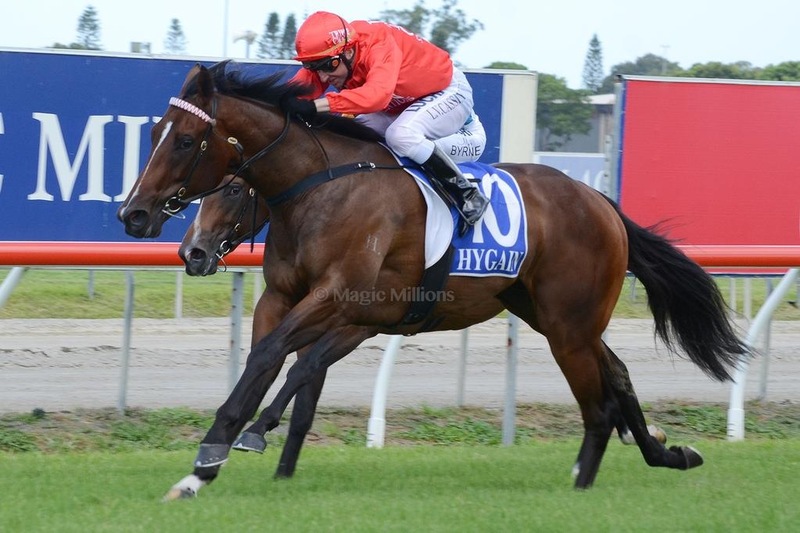 Sydney two-year-old Secret Trail has some big shoes to fill after winning the $100,000 Tattersall’s Racing Club Plate at the Gold Coast on Saturday. Secret Trail ($3.60) responded to a top ride from jockey Larry Cassidy to beat the favourite Powerful Saga ($2.80) by a length with another length to Skater Girl ($15) in third place. The Plate is run each year in conjunction with the Magic Millions March Yearling Sales and the honour roll is promising after four editions. It includes Flemington winner Black Cash (2011), Golden Slipper fourth placegetter Doubtfilly (2012), Group One winner Tinto (2013) and Listed race winner Aimee (2014). Peter and Paul Snowden picked out the race as a target for Secret Trail after she ran a good third at her only other start at Hawkesbury on February 26. Secret Trail was sold for $120,000 at last year’s Magic Millions January sales and is raced by a Triple Crown syndicate of owners. Cassidy was impressed by Secret Trail who is likely to return to Sydney. “Secret Trail is very professional,” Cassidy said. “She wanted to sit down in the barriers but we got away well enough and I was able to get a lovely run from the 500m. “She might go on to be more than handy,” Cassidy said. ← Watch NSW Racing – Wherever You Are!